Organised by the Countryside Alliance and National Gamekeepers Organisation, A Year in the Life of a Grouse Moor is a new addition to the daily arena programme and will be presented by John Cavana, of Patanavac Gundogs from near York. It will explain the management processes, flora and fauna and individuals involved in the upkeep of these unique habitats, how important they are to remote rural economies, and how their careful management benefits a host of other bird species, including curlew, lapwing, golden plover, merlin and ring ouzel. The programme will look at the life of grouse, from nesting to preparation for cooking and will be shown twice daily at 11.30am and 4.30pm and will include a simulated shoot. The Great Yorkshire Show is England’s premier agricultural event and runs from Tuesday 12 – Thursday 14 July and is expected to attract more than 130,000 visitors. Information is also the driver behind another part of the programme with “Beware the Tick Bite” in conjunction with the British Deer Society which will look at the threat of Lyme Disease which can cause serious symptoms in both humans and animals, how to avoid being bitten and what to do if a bite is suspected. 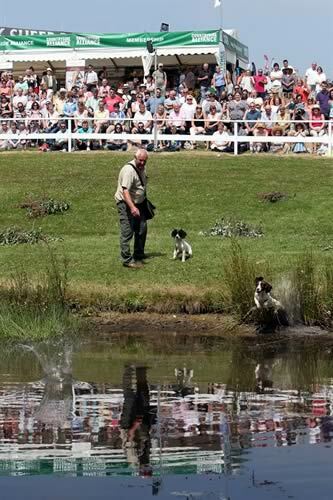 Dogs will also play a major part in events, with displays from the Catterick Beagles and Northern Counties Mink Hounds, gundog demonstrations from Mountgrace Gundogs and greyhounds and whippets presented by Arron Atmore. As well as grouse, other game birds are on the agenda with the return of Cornish countryman Chris Green with his look at Wildfowlers Past and Present as well as a Scientific Approach to Decoying Woodpigeons. Fishing is catered for by the Salmon and Trout Association, with twice-daily flycasting demonstrations by the founder of Yorkshire Flycasting, Brian Towers. Pest control will be covered with displays from Simon Whitehead of Pakefield Ferrets, not only looking at the control of rabbits, but also, with the help of legendary chef Rosemary Shrager in the Game Cookery Theatre, how the end result can be turned into delicious dishes. All activities take place in the Country Pursuits area of the showground which features two ponds in a natural amphitheatre that enables excellent viewing. The Great Yorkshire Show is organised by the Yorkshire Agricultural Society, a charity which supports farming and the agricultural industry. This will be the 158th Great Yorkshire Show Dates are Tuesday 12 – Thursday 14 July The venue is The Great Yorkshire Showground, Harrogate, North Yorkshire It is England’s premier agricultural event.